One month has passed since I last reported on the coral bleaching event that has been devastating coral reefs within the Seychelles inner islands. During that time the southeast trade winds have begun to blow and sea surface temperatures have dropped to 28 degrees centigrade, finally offering much needed relief to the reefs. Having been out of the country for the past four weeks, it was with a significant amount of trepidation that I visited the Baie Ternay Marine National Park to see how the coral reef was faring. The initial signs were not positive. 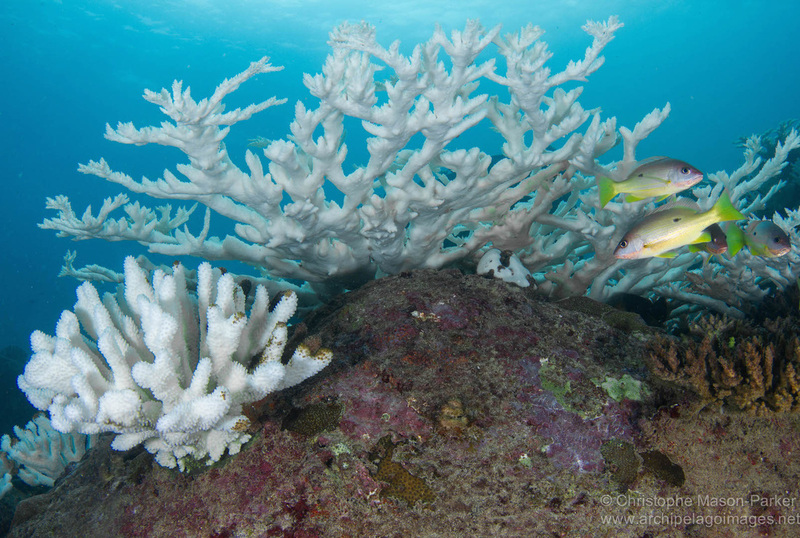 In the backreef, home six weeks earlier to the most vibrant shallow water corals within the Seychelles inner islands, virtually all colonies of Acropora and Pocillopora were dead, now covered in a thick layer of algae. Shades of pink and blue had now been replaced with brown. In the shallow backreef of the Baie Ternay Marine National Park, the majority of Acropora and Pocillopora colonies are now dead, their algal covered skeletons all that remains. In time the skeletons will break down to rubble, reducing the structural complexity of the reef, which fishes and countless other marine organisms depend on. Tabulate acroporids are particularly susceptible to bleaching with a large surface area exposed to sunlight. Many of the larger table corals within the Baie Ternay Marine National Park are already dead with signs of algal growth upon the corals surface. 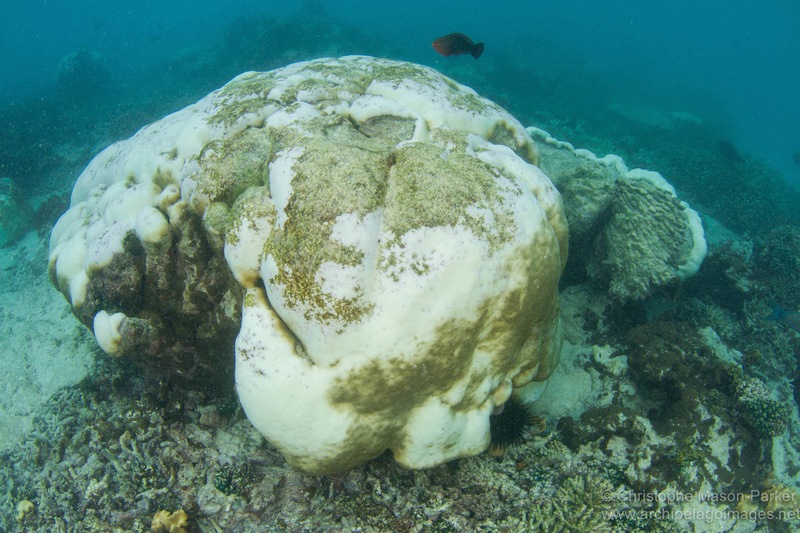 Porites was one of the first genera to exhibit bleaching. These slow growing corals are more robust and despite having bleached, parts of the above colony remain alive. ​​On the deeper reef the scene is no better. Baie Ternay is famous for its fields of vibrant branching Acropora, and the huge tabulate Acropora that provide shelter to numerous fish species. 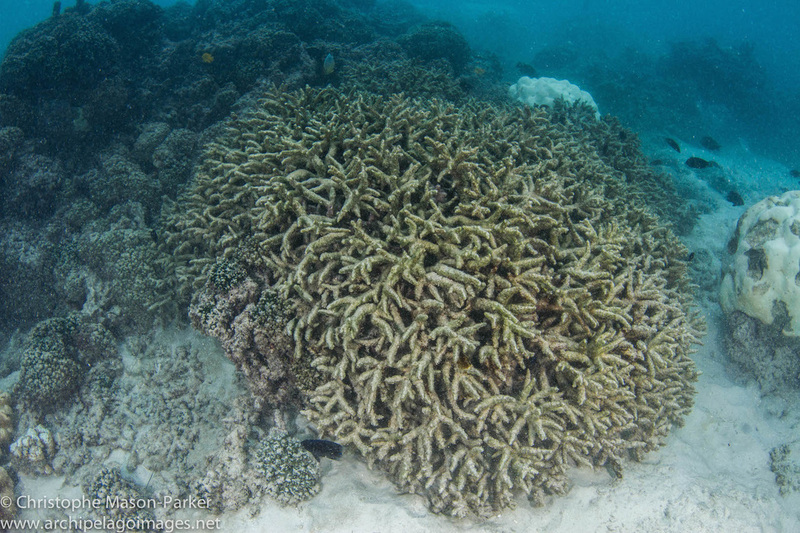 The Acropora is now dead, and has been replaced with algal covered calcium carbonate skeletons. 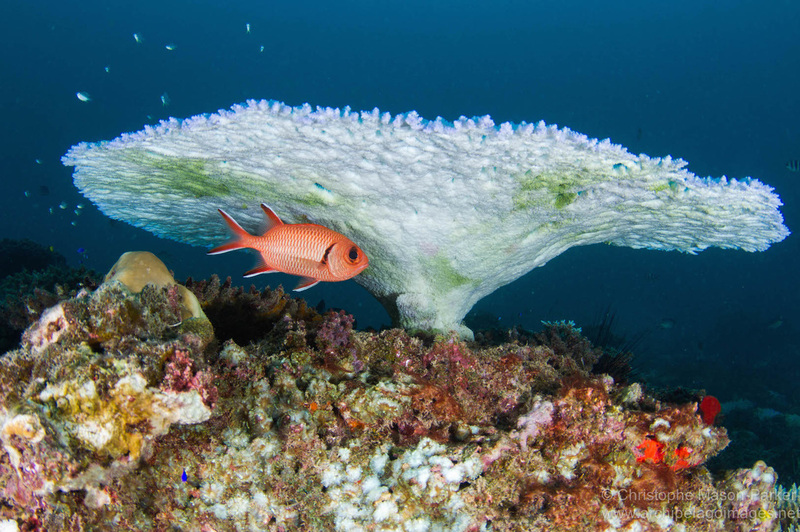 Many of the table corals are already beginning to break up and in doing so the fish species that once sheltered beneath them become more vulnerable to predation. 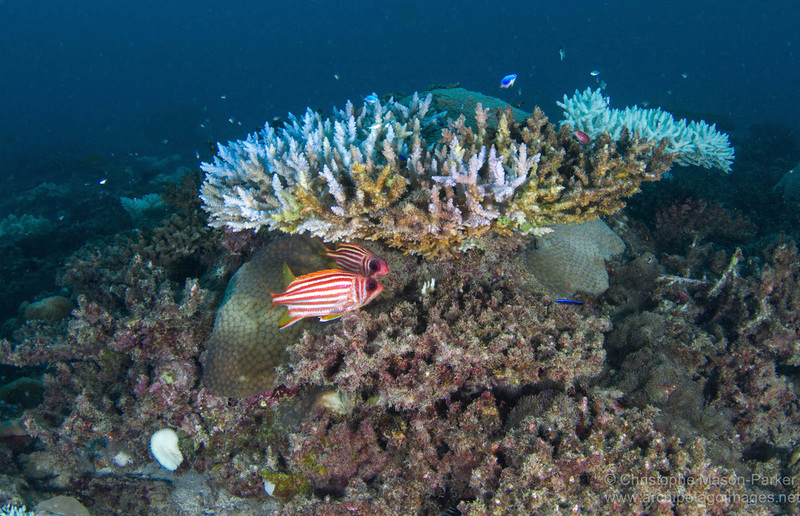 Similarly, many fish have very particular diets and the obligate corallivores that once fed on these corals will now find it increasingly difficult to source food. The process is already underway but it will be some time before the consequences of this cascading effect will become fully appreciated. The above four images were taken over the space of three months, during which time this colony transformed from being healthy to bleached and now dead. In the final image the white skeleton contrasts against the brown of not healthy tissue, but dead coral that as been overgrown by algae. Soon the entire coral colony will be smothered by algae. Outside of the Baie Ternay Marine National Park the picture is patchy. At Grouper Point most corals are bleached yet some remain alive. There is mortality but not at the same scale, perhaps due to the exposed nature of the site or its location adjacent to deeper, cooler waters. 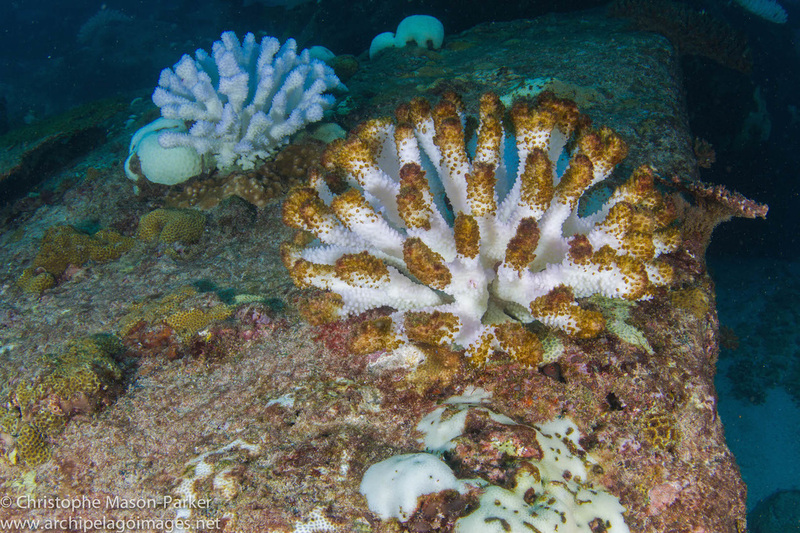 For some of the larger coral colonies sea temperatures appear to have dropped just in time, while they remain a ghostly white their polyps are still alive. A pair of Chaetodon guttatissimus pass over a bleached coral assemblage at Grouper Point. A dead coral colony of Pocillopora eydouxi. Algae has started to grow over the corals surface and will soon cover the entire skeleton. 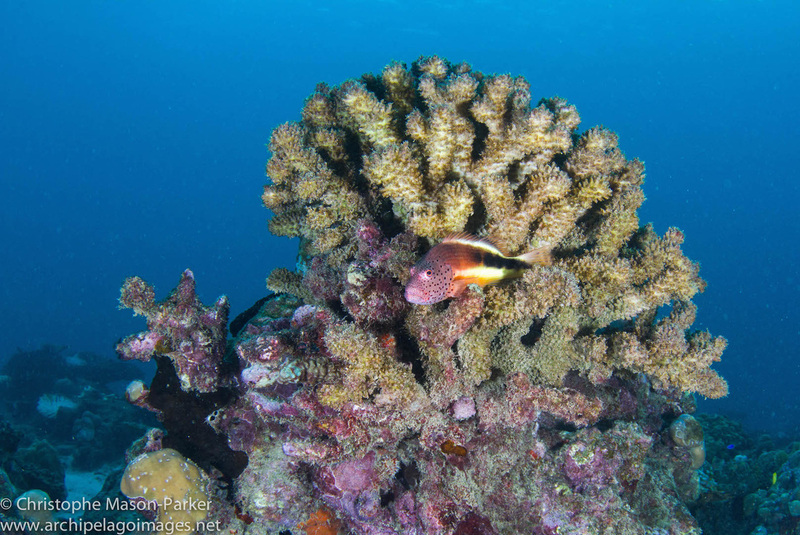 Tabulate corals offer protection to numerous fish species. Soldierfish (below) are nocturnal, preferring to spend daylight hours in crevices and under coral ledges. As the structure of the reef crumbles there will be fewer places for these fish to hide, making them more susceptible to predation. The carbonate reefs of Beau Vallon bay are shallow and like Baie Ternay contained extensive fields of Acropora. At Scala reef these are now gone, replaced instead by dead, brown skeletons interspersed with the occasional bright, white Faviid or Porites colony. 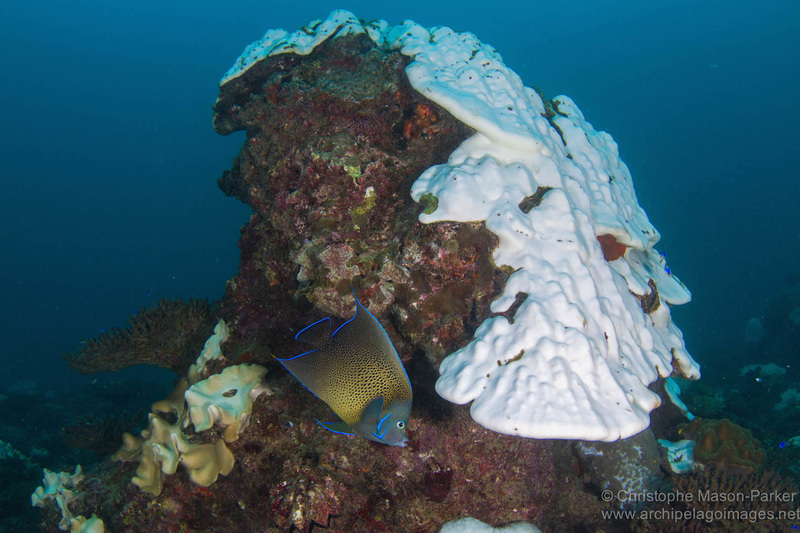 A semicircle angelfish (Pomacanthus semicirculatus) swims past a bleached Porites colony. A freckled hawkfish (Paracirrhites forsteri) perches on a dead Pocillopora coral (below). Amongst the devastation there is some cause for optimism. There are coral genera that appear to have avoided bleaching. Goniopora and Symphillia have done well, while the huge shallow water colonies of Leptoria in Baie Ternay appear unscathed. At this time it is difficult to assess the extent of the damage caused by the recent coral bleaching event. 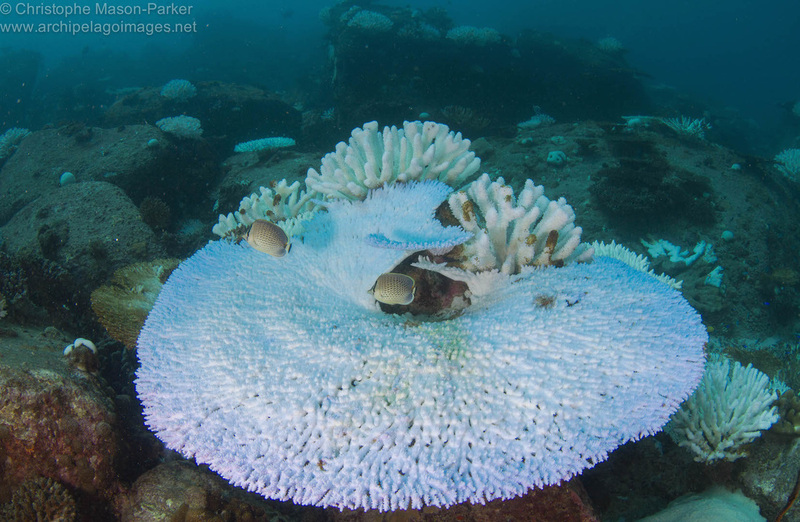 Some coral colonies will recover, while for others it is already too late. Over the coming weeks there will undoubtedly be further coral mortality and true scale of the die-off will become apparent.